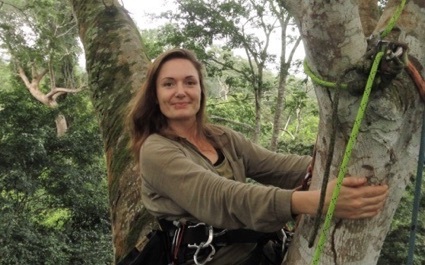 Assistant Professor of Anthropology Vicky Oelze conducted the stable isotope analysis of plant foods eaten by chimpanzees living in tropical forests and savannah woodlands. Chimpanzees are generally known as the ripe-fruit specialist among the great apes, but they also incorporate other food items, such as leaves and seedpods, into their diets. Chimpanzees inhabit both rainforests and savannah regions of Africa, and their diets vary accordingly. Forest dwelling chimpanzees mostly feed on ripe fruits commonly considered easy to process, while savannah chimpanzees include more challenging non-fruit items into their diet. Vicky Oelze, an assistant professor of anthropology at UC Santa Cruz, participated in a new study led by researchers from the Max Planck Institute for Evolutionary Anthropology in Leipzig that analyzed the mechanical properties and the isotopic composition of plant foods eaten by chimpanzees living in the tropical forest and savannah woodland. They found that the savannah chimpanzees eat foods that are more mechanically challenging and therefore may place higher selective pressures on their chewing apparatus compared to their counterparts living in the rainforest. Since early hominins likely evolved in an environment similar to that of today’s savannah woodland chimpanzees, early human ancestors may have encountered similarly challenging foods. "If we better understand the foundations and interactions of food material properties, dental wear processes, and isotopes in modern chimpanzees, it opens a window into the past and helps to interpret the data obtained from fossil specimens who lived in the African savannah several million years ago," explained Oelze, a guest researcher at the Max Planck Institute for Evolutionary Anthropology, who conducted the stable isotope analysis while she was a postdoctoral researcher there. Oelze's research focuses on primate ecology, prehistoric diets, and the feeding ecology of great apes. 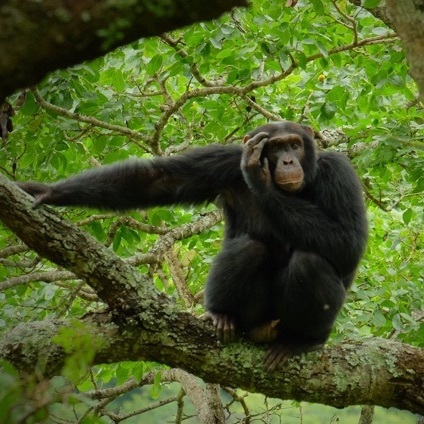 Savannah chimpanzees are thought to rely on non-fruit resources more than their forest counterparts. The mechanical properties of plant foods can vary substantially but until this study, there had been no comparative data available for chimpanzee populations living in distinct habitat types. Adam van Casteren of the Max Planck Weizmann Center for Integrative Archaeology and Anthropology at the Max Planck Institute for Evolutionary Anthropology compared the material properties of various plant foods eaten by chimpanzees in a tropical rainforest in Uganda and a savannah woodland in Tanzania. Using a portable mechanical tester, he measured the physical properties of plant tissues and found that some plant parts from the mosaic savannah woodland habitat, such as the outer casing of the Strychnos fruit, had much higher toughness and stiffness values than the plant tissues he tested from the rainforest. "I was surprised to see that some values even exceed those recorded for orangutan foods, as they are generally considered to consume the most mechanically challenging diet of all the great apes," said van Casteren. The scientists combined their plant food mechanical data with data from a stable isotope analysis from both plant and chimpanzee hair samples. Carbon stable isotopes are commonly used to reconstruct dietary ecology and habitat use of living and extinct primates. Dental morphology, food mechanical properties and carbon stable isotopes are all highly relevant for reconstructing past diets of early human ancestors in Africa. Although the carbon isotope values of plants were remarkably similar in both habitats, the isotope data obtained from chimpanzee hair suggested that savannah chimpanzees frequently feed on plants growing in open canopy areas. These likely include plants that are particularly demanding when processed with the teeth. The authors believe that the consumption of such tough foods is facilitated by the large front teeth of chimpanzees. "While some chimpanzee populations are using tools to crack open nuts, others like these savannah chimpanzees still rely on their teeth to get access to nutrients," said Kornelius Kupczik, co-author and Track Leader of the Max Planck Weizmann Center. "Such differences in selection pressures acting on the teeth are likely to have played a key role during the evolution of hominins."